[iPhone] Do you constantly forget to take your medications? Pillboxie will help you remember! Do you find yourself habitually forgetting to take your medications? Do you normally take vitamins or herbal remedies, but just can’t remember to take them with any consistency? If you are one of the many users that struggle with either situation, then Pillboxie might be just the app for you. 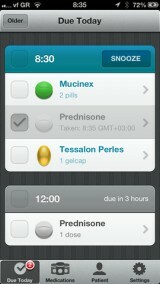 Pillboxie is a reminder app for your personal medications. If you are one of the millions of users who take some sort of medication each day and struggles with remembering to take them, then Pillboxie might be a great assistance to you. Though the app is meant for medications, it is worth noting that you can use it to keep track of vitamin and herbal pill consumption as well. The app allows you to enter all medications for as many users as you want and provides an optional privacy passcode for those who want to keep their health information private. The developers were clever in creating the ‘medication’ tab of Pillboxie. It allows you to enter the medication’s name and appearance (i.e. shape & color), as well as the prescribed reason and instructions for taking the medicine. 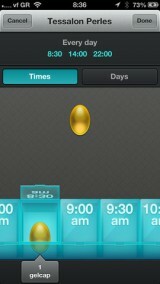 You also can create a reminder schedule for when to take the medicine using a brilliantly designed pillbox. All you need to do is drag the pill to the normal times you take the medicine, drop it in the pillbox, and the reminders are set. It is worth noting that there were some features missing from the medication section that perplexed me a bit. Pillboxie doesn’t include a dosage section, which is a major oversight in my opinion. You could hypothetically put it in the instructions section, but this seems like something that should have its own category. You also will absolutely need your pill bottles in front of you when trying to spell some of these medications, because there is no database connection for that purpose. I would have expected some sort of auto-completion suggestion script, similar to Google’s, as you are typing the medications in. Some other important features of Pillboxie are the handy push notifications included. When you set your reminders, the app will send a push notification whenever it is time to take your pills. If you are currently busy, you also have the option of using the snooze button to postpone a notification to a later time. The snooze button is located on the main page of the app, which is basically a full checklist of all of your medication reminders for the day. All you need to do is check off the medication when you take it. One thing that was missing from Pillboxie is some sort of iCloud syncing feature. There are many users out there that constantly go between their iPhone and iPad, but presently there is now way to sync your medication schedules between the two. This is also a glaring oversight, as you are basically left to just using one of your devices. Although this won’t affect every user and the app is still quite useful for many, I hope the developer adds this feature in the near future. 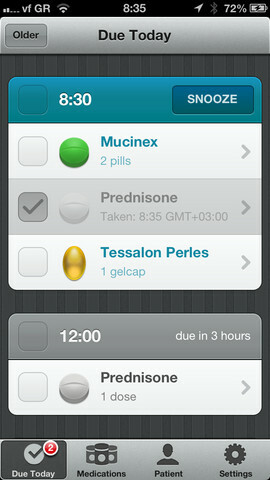 Pillboxie is a useful pill reminder app for the millions users who need to take medications, vitamins, or herbal remedies. Though there are a couple missing features such as syncing between devices, Pillboxie is an excellent resource for anyone who has trouble remembering to take their pills.